Pusateri's was opened in the Chicago area in 1963 and they have their own authentic Chicago way of baking pizza. 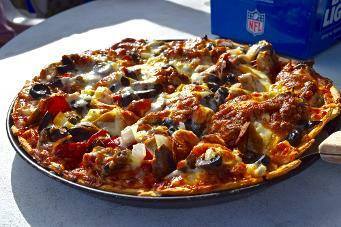 Its a thin-crust Chicago version yet topped with tons of goodies and great sauce. Try the Rendino sauce if your more into Italian from Italy style pizza. Try the marinara thick for the true Chicago experience.